Now on view in the exhibition Abstract Expressionism: Looking East from the Far West is a luminous collage by Dr. Tseng Yuho. Also known as Betty Ecke, she had her first exhibition at the museum in 1959, and her husband, Dr. Gustav Ecke, was the museum’s first curator of Asian art. It is always a thrill for museum staff to have work in the galleries by artists with a special connection to HoMA. So the museum was deeply saddened to learn that this celebrated artist, author, scholar, educator, visionary, and philanthropist died on Sept. 16, in China. 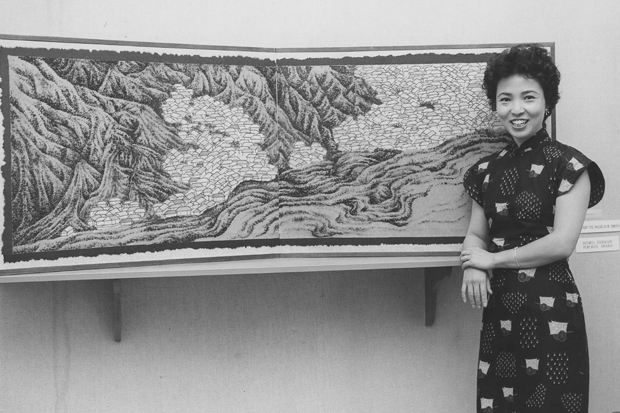 Born in 1925 in Beijing, China, to a distinguished family, Tseng excelled in the arts. Her remarkable talent was recognized early on, and she trained in classical painting with the chief Manchu House representative Prince Pu Jin. After attending Furen University, she married Dr. Ecke in 1945. Four years later, the couple moved to Honolulu, where she received a master’s degree from the University of Hawaiʻi. She obtained her doctoral degree from the Institute of Fine Arts at New York University in 1972. Tseng taught at the University of Hawaiʻi until 1986 and served as a consultant to the Honolulu Academy of Arts (now the Honolulu Museum of Art), where her husband was on staff. Tseng achieved early success in multiple fields—at a time when few women or minorities were properly acknowledged for their accomplishments. Her skills ranged from traditional Chinese mount-making, painting, and calligraphy, to literature, writing, and teaching. She exhibited internationally in cities such as Beijing, Hong Kong, Singapore, Shanghai, Munich, Zurich, and Paris. A 1946 solo exhibition in London captured the attention of legendary art historian Michael Sullivan, who wrote a glowing review. Her first paintings were traditional, often landscapes created in homage to Chinese masters from the Song, Yuan, Ming, and Qing dynasties, but her subsequent work would become a masterful and innovative synthesis of the East and the West. 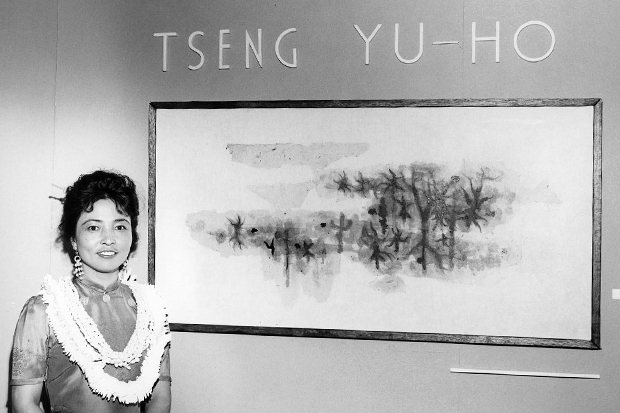 Tseng Yuho at her July 8, 1959, solo exhibition opening at the museum. In 1954 the Smithsonian traveled her solo exhibition to ten museums. In 1956, the Juilliard School commissioned her to design stage sets and costumes for the operas Job by Luigi Dallapiccola and L’Orfeo by Claudio Monteverdi. During the 1950s and 1960s, she toured Europe, and met artists such as Marc Chagall, Max Ernst, George Braque, and Salvador Dali. 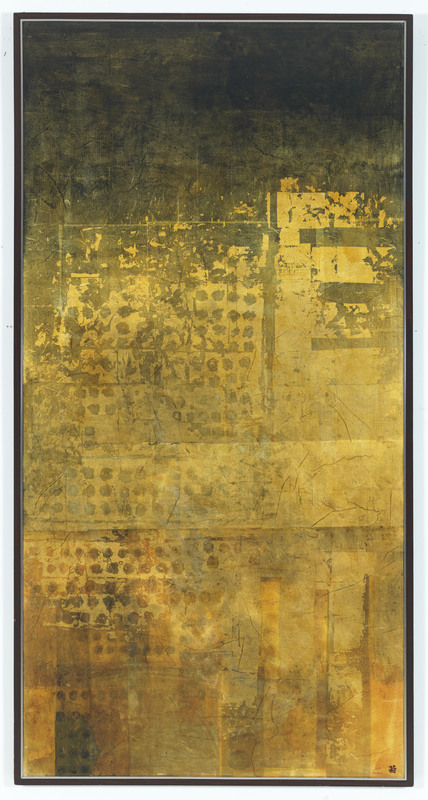 In the early 1950s, she began making dsui hua, or “assembled paintings,” from mixed media and paper collage. By 1962, this had become her signature style and was featured in an article on Tseng in Time magazine. In her later years, she continued in this vein, and the resulting works became progressively more abstract—vibrant, nuanced, and innovative—yet never lost their spiritual connection to the classical Chinese canon or to the natural world. 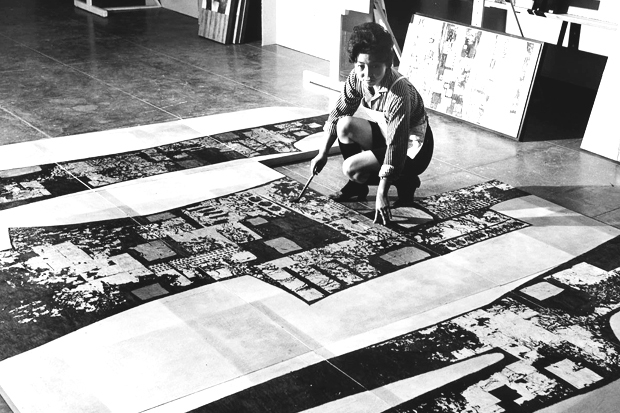 In the 1970s Tseng returned to Hawai‘i, where she continued painting while also dedicating herself to academic pursuits as a professor in the University of Hawai‘i’s art department. The Hawai‘i State Art Foundation commissioned her to create public works for a number of locations, including the Daniel K. Inouye International Airport in Honolulu. During this time, she organized exhibitions and published several books on art. Her catalogue Chinese Calligraphy was officially presented to Chinese leaders Mao Zedong and Premier Zhou En Lai during President Nixon’s visit to Beijing in 1972. In 1974 she received the Paul S. Bachman Memorial Award for “distinguished contributions to the improvement of relations between the United States and Asia.” From 1977 to 1985 she was the first Director of Council for Chinese Studies at the University of Hawaiʻi. Additionally, she was a founding member of local organizations such as The Oriental Art Society of Hawaiʻi (now Society of Asian Art of Hawaiʻi) and Friends of the Library. In 1990, she was recognized as a “Living Treasure of Hawaiʻi.” In her later years, Tseng returned to China, where she remained until her death in Weihai (Eastern Shandong Province). Betty was a remarkable woman and an outstanding artist. She will be missed. A little book that I treasure: Some Contemporary Elements In Classical Chinese Art by Tseng Yu-Ho, University Of Hawaii Press, 1963. It contains insights into different Chinese art styles by her brilliant commentary and comparisons with Western art that shed light on the images of the rare Chinese artworks illustrated.